How many calories in Celeriac? See below, the Celeriac calories for the different serving sizes. We provide you with the Celeriac nutrition facts and the health benefits of Celeriac to help you to lose weight and eat a healthy diet. Celeriac or Celery Root is a large bulbous root vegetable. Nearly 10% of the vegetable is made up of carbohydrates, and about 5%, starch, but it is bursting with both vitamin K and phosphorus. It is also a good source of vitamins C, B1-B3, B5, B6, B9, potassium and other minerals. Celeriac contains polyacetylenes which have been shown to be beneficial against cancer, although more research is required. 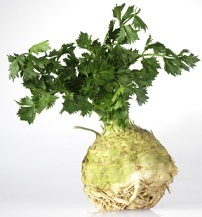 Other Celeriac benefits include helping to lower your levels of cholesterol. Note that it has been found that Celeriac may trigger allergies related to pollen. We have two calorie tables below, one for when the vegetable is raw, and the other when it is boiled. You'll notice that when boiled, the number of calories are lower. However, when you look at the nutrition table, the concentration of nutrients, when boiled, is substantially less. See our vegetable calories comparison chart to compare the celeriac calories with the other calories in other vegetables. This will assist you in building your diet plan. Also, have a look how nutritious Celeriac is in comparison to the other vegetable nutrition. All our calorie information is sourced from the US Department of Agriculture. There is no information available for steaming of this vegetable, but we always recommend steaming to boiling where possible.